Starting from 21st on the grid after a gearbox problem in qualifying, Red Bull's David Coulthard had little to lose at the Bahrain grand prix on Sunday. 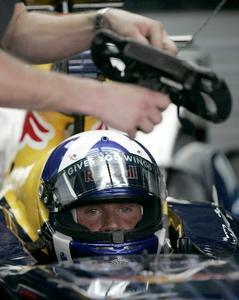 Coulthard opted for an aggressive race strategy and had just moved up to seventh position when he called into the pits for his stop. Seconds later he was cruising back in with a driveshaft failure. Team-mate Mark Webber took over the seventh spot and despite his fuel flap being open was running well until he suffered a gearbox failure. Points lost for the Red Bull Renault team again. Christian Horner “Frustrating is the only way to describe today’s race. Driving an aggressive strategy, David was a candidate for driver of the day. He overtook more than ten cars and looked set for a strong points finish, only for a driveshaft related failure to force his retirement. Mark made a good start and pushed Fisichella very hard in the first stint.